Oh cool, Stanley Kubrick is still alive. You almost have to respect the University of Alabama for so boldly and dickishly doubling down on the extreme inequality that plagues college athletics, without even the slightest care for the awful optics of their decadence. Almost. Nick Saban already makes at least $8 million a year. Basketball coach Avery Johnson, who reportedly “ran a lap around his office” when he saw yesterday’s news, gets $3 million annually. Meanwhile, their players get minimal compensation despite their massive value to the school. The extra millions from those salaries alone could already be easily redistributed to the athletes who actually deserve it. But now, Alabama has announced $600 million more that won’t go towards paying the players, because every athletic department has to pretend that it’s not making a profit. Instead of wages for labor or maybe funding for educational purposes, that $600 million will be spent on upgrades for their football and basketball stadiums to become even more efficient at bilking nostalgic rich alums out of their money under the guise of “donations.” Here are the elaborate renderings of the renovations that will somehow be worth more than the GDP of a small island nation. 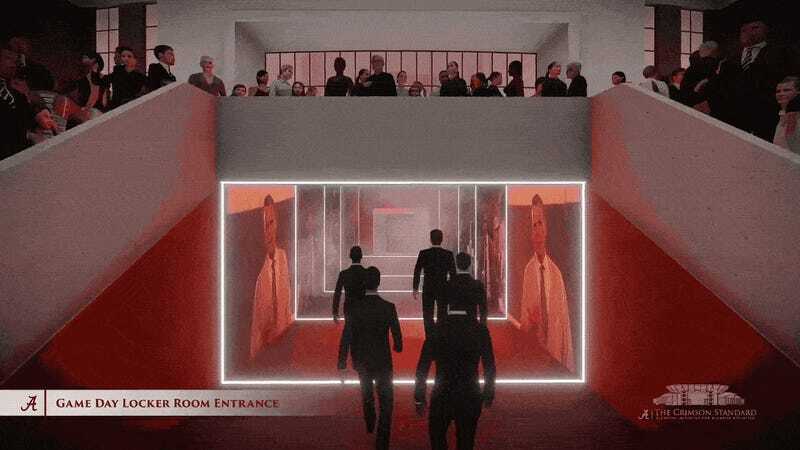 A few of the renderings show some improvements that will be experienced by players—most weirdly the locker room entrance that looks straight out of 2001: A Space Odyssey. But really all the work just seems to provide even more places for Alabama one percenters to hang out at their old college’s games without actually watching the games. The video outlines at least eight different clubs or lounges to be added by the renovations, including a “Fan Club Lounge,” a “Courtside Club,” a “Sideline Club,” a “Recruiting Lounge,” a “North Field Club,” a “West Terrace Club,” a “West Champions Club,” and a “Founders Suite Lounge,” the last of which definitely looks like the planned venue for domino-masked wealthy-person orgies to go down while the Tide beat The Citadel by 70. Let’s all hope the college sports scam doesn’t survive long enough to see the completion of this middle finger disguised as a construction project.